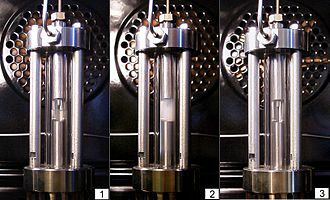 Left-to-right sequence of heating a mass of ethane in a constant volume. In the center panel, critical opalescence is seen. Critical opalescence is a phenomenon which arises in the region of a continuous, or second-order, phase transition. Originally reported by Charles Cagniard de la Tour in 1823 in mixtures of alcohol and water, its importance was recognised by Thomas Andrews in 1869 following his experiments on the liquid-gas transition in carbon dioxide, many other examples have been discovered since. The phenomenon is most commonly demonstrated in binary fluid mixtures, such as methanol and cyclohexane. As the critical point is approached, the sizes of the gas and liquid region begin to fluctuate over increasingly large length scales (the correlation length of the liquid diverges). As the density fluctuations become of a size comparable to the wavelength of light, the light is scattered and causes the normally transparent liquid to appear cloudy. Tellingly, the opalescence does not diminish as one gets closer to the critical point, where the largest fluctuations can reach even centimetre proportions, confirming the physical relevance of smaller fluctuations. In 1908 the Polish physicist Marian Smoluchowski became the first to ascribe the phenomenon of critical opalescence to large density fluctuations. In 1910 Albert Einstein showed that the link between critical opalescence and Rayleigh scattering is quantitative . This page was last edited on 24 November 2018, at 04:06 (UTC).